Disclaimer: Please do not take anything I say in this post too seriously. It is purely for fun, to draw a humorous awareness to the current fall fashion scene. I had a fashion post planned this Friday like I always do, but when I saw the photos I scratched it...first time ever. Now not all of my fashion shoots go as planned, but I usually still post them. Then I'm surprised when they get a lot of hits or pins. Sometimes I am my own worst critic and the outfits/pictures I dislike the most will often be the most popular. But this time, no, never. The outfit did not look stylish at all and looked like something I'd wear milking cows...I know flannel is "in", but I just looked fat and frumpy. My husband however was very disappointed when I decided not to use the photos, because he really liked them. Of course he would...they involved flannel, a chainsaw, and his wood pile...why wouldn't he like it? Perhaps if I wasn't being viciously attacked by mosquitoes during our photo shoot, I would have gotten better pictures and thought otherwise. But the mosquito attack made me frown at the camera and hasten our photo shoot. So I was going to skip a fashion post this Friday since I had no pictures that were "Blog Worthy". But then I started seeing all these fashion posts in Blog Land like "What You Must Have This Fall! ", or "New Fall Trends!" etc., etc., etc., and then being the fool that I am I would click on them only to discover there was nothing new at all and it was the same old stuff. And that's when a light bulb went off in my head of what my Friday Fashion Post would be...how there is almost nothing new for fall! Lets start with jackets. The Must Have Jackets this fall are denim, moto, and the utility jacket. O.k. now are any of these options new? 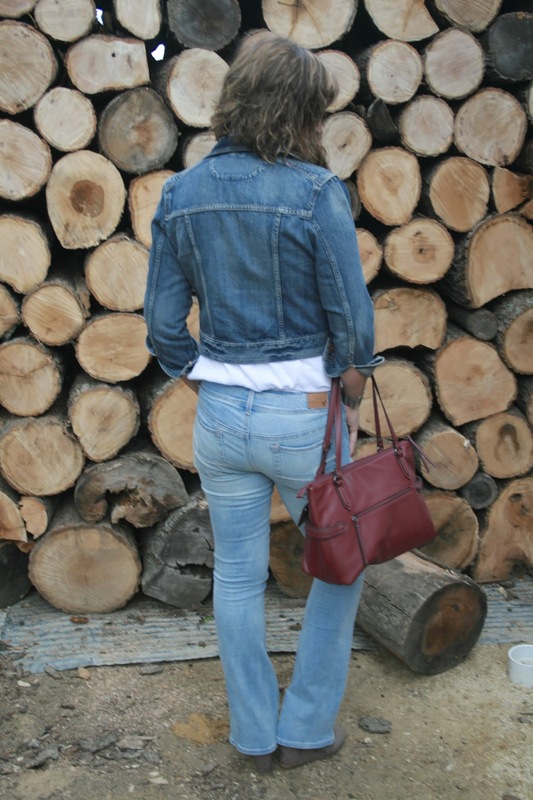 How many years have denim, moto, and utility jackets been trending now? Lets go back in blog memory lane shall we. Denim. Always classic, never out-of-style, but it was really trending about three or four years ago when I first started fashion blogging. In fact, I had a hard time even finding a denim jacket in stock, they sold out so fast. I ended up settling for one that was too expensive and ill fit. Proof? My very first fashion blog post written July 1, 2013. The sleeves are so short, I can only wear the jacket with the sleeves rolled up to hide it. Since then I've accumulated two more denim jackets: a Levi trucker jacket and a white denim jacket. Next. Moto jackets. I have a gazillion of these in various colors: black, burgundy, white, silver.... but my very first one ( I think) was purchased for $15.00 at Forever 21 three years ago and I'm still wearing it! And lastly, the Utility Jacket. I can't tell you how many posts I've seen this week about how everyone must get a utility jacket this fall. Really, you don't have one yet? I already own two, one is a shorter, more fitted jacket from Dress Barn (shown HERE purchased three years ago) and another I received from Stitch Fix (see that post HERE) two years ago. In all fairness, I also must mention the bomber jacket. This jacket appeared on the scene last season and really picked up steam this season. I would love to add one to my wardrobe, but I haven't found one yet that I feel flatters me; I refuse to give in to a trend if I don't think it looks good on me. I love this one from Forever 21, but I would need a different color as I already own a moto jacket in this color. So now lets move on to actual fall clothing that's trending right now: Flannel, fall florals, turtlenecks, velvet, long cardigans, and sleeveless sweaters or sweater vests. With the exception of velvet and fall florals, most of these items have also been in style for quite sometime...especially flannel shirts. I mean come on, how long now have the popular teen stores like American Eagle and The Buckle been selling flannel shirts? I remember walking past the American Eagle store in our local mall when my daughter was in High School (which was many, many years ago) and mockingly saying "Oh look, there's the flannel shirt and jean store! ", because that's all they seemed to sell. But, I will admit, flannel just keeps getting hotter and hotter every year, and shows no signs of slowing down. If only I could wear one without feeling like a slob! Sigh. 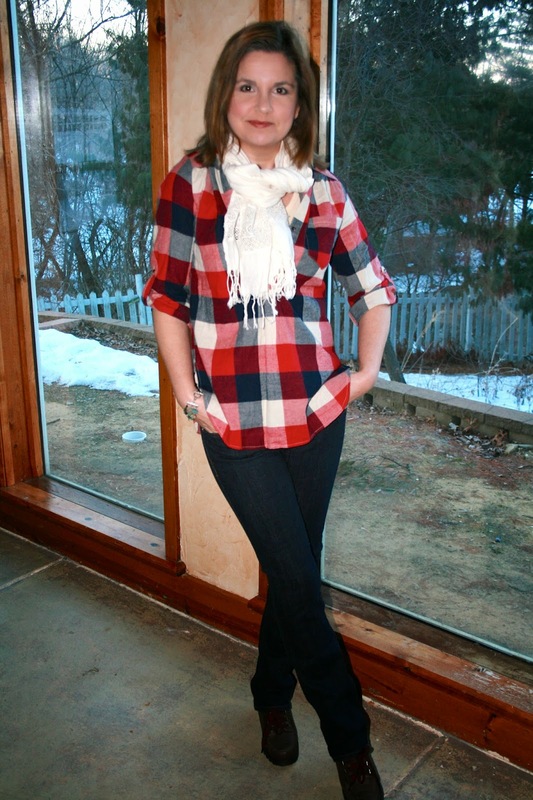 Here is my very first flannel shirt post, of which I posted many thereafter. Heck, I even went out and bought another flannel shirt (that was suppose to be today's post), that's how much I'm trying to wear this trend. 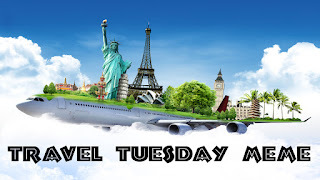 This post was written March 28, 2014 and you can find it HERE. O.k. so we all know flannels are nothing new, but what about the rest? How about Fall Florals? This one is new to me. I have never done a fall floral post before, probably because I generally don't think of flowers in the fall and winter months. But, fall florals on a dark background is definitely trending, and I can't wait to wear my new fall floral dress I received in my last Fix HERE. What about turtlenecks and velvet? Well, they aren't necessarily new...they've both been around for ages. I remember wearing velvet dresses as a little girl, a teenager, and in my twenties. I even remember owning a couple velvet blazers in my thirties (darn it, I wish I hadn't gotten rid of those). And turtlenecks, do they ever go out of style? No, again, they are just trending, but they are considered a classic closet staple. Now, I'm not fond of either of these trends to be honest, although I did invest in a couple of turtleneck sweaters this season and last (they are more cowl necks rather than turtle necks). As for velvet, I almost bought a velvet dress last year but I put it back because I thought it made me look fat . I'm not sure I'll invest in any velvet clothing. I've always found velvet to be a lint magnet and uncomfortable to wear. 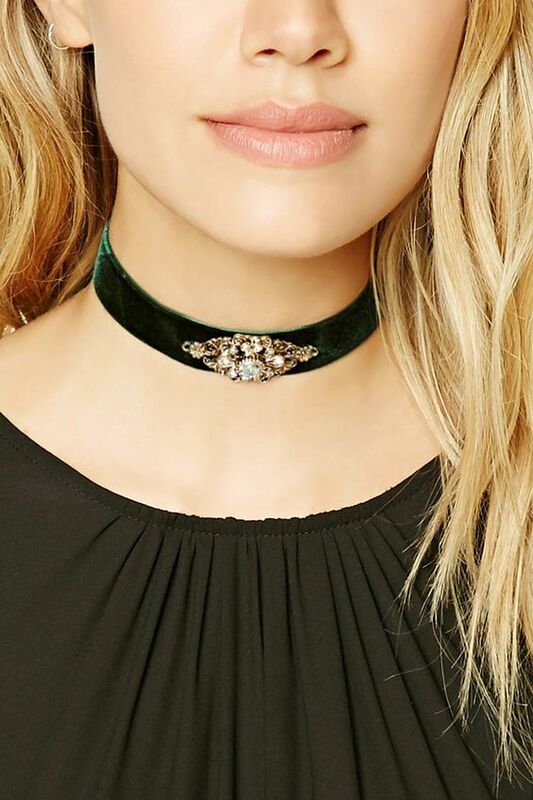 I did buy some cute velvet chokers from Forever 21 and I might be open to velvet shoes or a velvet bag...but that's about it. How about sweaters? I remember when the big Nordstrom anniversary sale was going on awhile back and everyone was so excited and kept posting their picks. I found the whole social media event quite humorous because I literally saw nothing, and I mean absolutely nothing new. Everything looked like the same stuff from last year, and I couldn't for the life of me figure out what the hype was all about. And those prices? Holy Crap! Do you ladies actually consider spending $150 dollars for a cardigan a sale? That's what I would spend on a dress to wear to my first born child's wedding! A sale for a cardigan to me would be $19.99 or less! Oh, and the same sweaters you purchased last year are still on sale this year...long cardigans especially. So if you didn't grab any long cardigans last year, your in luck, cause they are still in style this year! Now lets talk sleeveless sweaters. There I see a slight change, and for the better. Last year they emerged on the scene in a chunky knit and cropped. I purchased this one pictured below, but I never really liked it because the thick knit, again, made me look fat, and also the shortness of the sweater. My husband never liked this sweater either. This season sleeveless sweaters are all longer and come past the hip to elongate the figure and you can find them in various knits to suit your preferences, not just a chunky knit. 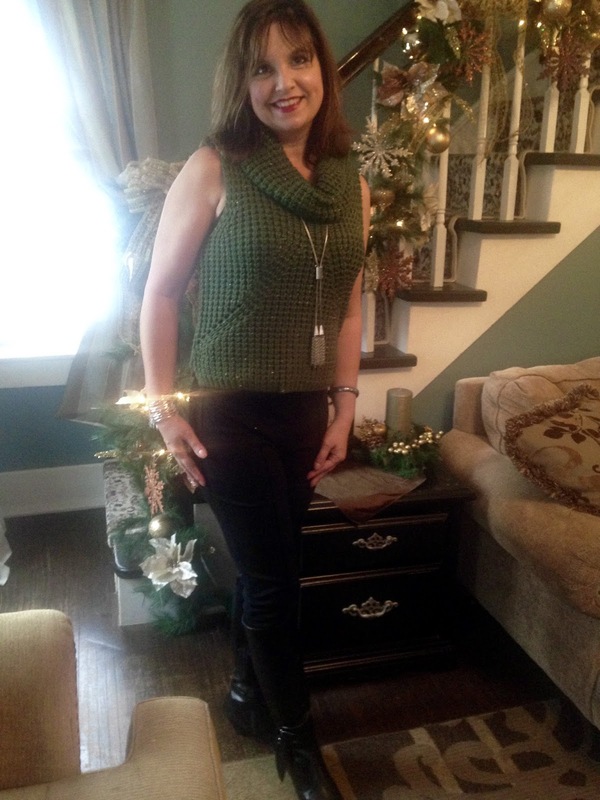 See my previous fashion post HERE for a thin knit, long sleeveless sweater. When I was shopping for fall clothes with a friend recently, I found many items that I purchased late in the season last year still available this year. 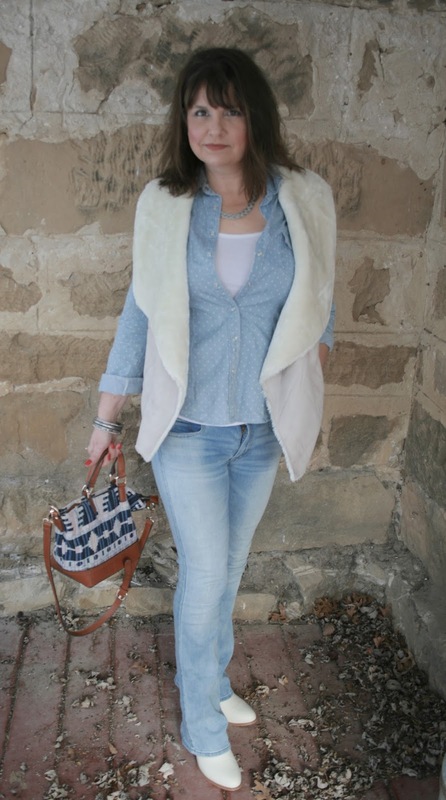 I bought this cute suede vest after Christmas, but I did not get to wear it much due to an early spring. I was so happy to still see suede vests for sale in all the stores. Sweater vests are also still popular, again, another thing I'm thrilled about since I hardly got any use out of mine last year. What I haven't seen yet are fur vests, and I will be very disappointed if those don't make a comeback because I bought two of them last year and barely wore them. But, it just could be too early to see fur yet. When I was in Vail in May all the women either had leisure wear on or a fur vest with tall boots. So I'll keep my fingers crossed that I won't have to toss them in the charity pile! Now what about shoes trends? Again not much new. Booties are dominating the shoe scene more than ever, especially when worn with dresses. Even though style bloggers have been wearing booties for years, I think it took mainstream women three years to catch on to them. But I already own more booties than I can count. In fact these booties I bought last year are still available this year! Although I already own more booties than I need, I still wouldn't mind adding some more booties to my collection. I would love a burgundy pair, another pair with cut outs, or more chunky heeled booties. 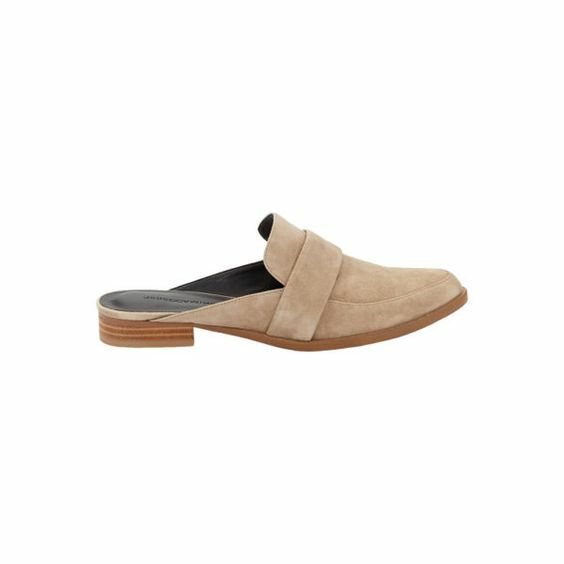 Sliders are new and huge among style bloggers. I wouldn't mind trying a pair of these, but I haven't seen in any in my local stores yet. It might be another season or two before they make it to up north to us hillbillies. Finally, lets talk about color. Colors trend season to season just like style. Every year I look forward to finding out Pantone's Color of the Year! This year their Fall Color Report (see the full report HERE) projected blue, grey, red, mustard and others as the trend for fall of 2016. But what colors am I really seeing trending on the street, in stores, and on fashion blogs? The same as always: Olive Green and Burgundy. Except everyone seems to call the burgundy color by a different name: wine, Merlot, Bordeaux, fig, plum, maroon, oxblood....I'm getting so confused! It's all the same color isn't it, just with different variations of browns and purples added to the red, can't we just agree on a name? Whatever you decide to call it, if you want to be "in" this season, you need this color in your closet, along with olive green, because they are the "IT" colors this season, just like they were last season, and the season before that. They are fall colors! There are only so many fall colors right? I mean burgundy, dark green, rust, burnt orange, reds, browns, mustard yellow: they are all colors we expect to see in fall fashion because we see them in nature every fall. The colors don't change, just which ones are the 'hottest' that year. And this year it is burgundy and olive! So what does all this mean to you, the consumer? Well, if you've already purchased most of these trends in the past few years your wallet is going to be a lot heavier because you really don't need to go shopping for much, if anything, new this season. And if you missed out on some trends last year, well your in luck, because you can still pick these items up this year. As for retailers, I don't see them making much profit this year since the styles have not changed too much. But I'm not an economist, so what do I know? What I do know is that the fashion industry better get a little more creative in providing women of all shapes, sizes, and ages with new styles, or they will be running out of business! So what about you? Have you seen any new trends that I've missed on this post? I'd love to hear from you! This is a continuation of a travel series of a camping trip I took with my family back in July. If you missed previous posts, you can catch up HERE and HERE. 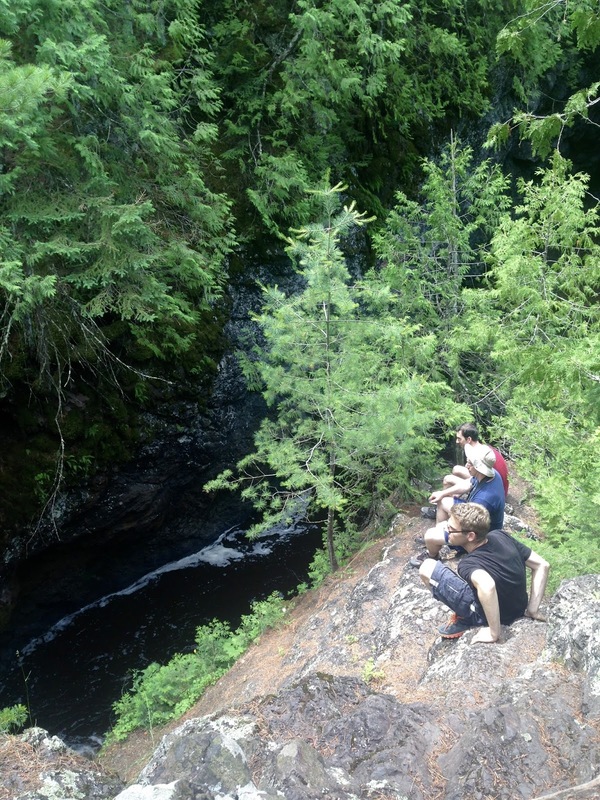 On the third day of our camping trip we drove to the Upper Peninsula to see waterfalls in the Ottawa National Forest. 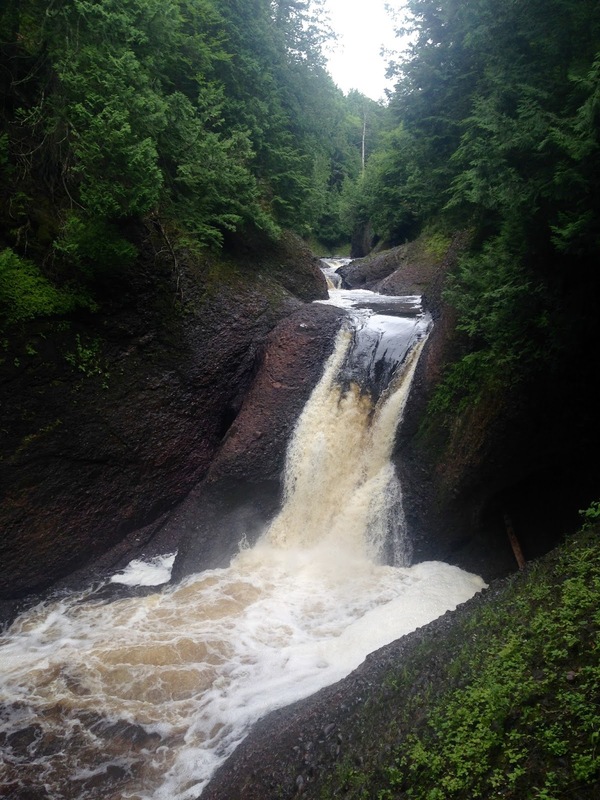 On this day, we drove The Black River National Scenic Byway to see five waterfalls plus Lake Superior. To keep my posts from getting too long and photo heavy, yet also to cover each fall thoroughly, I am going to cover each stop along the byway separately. 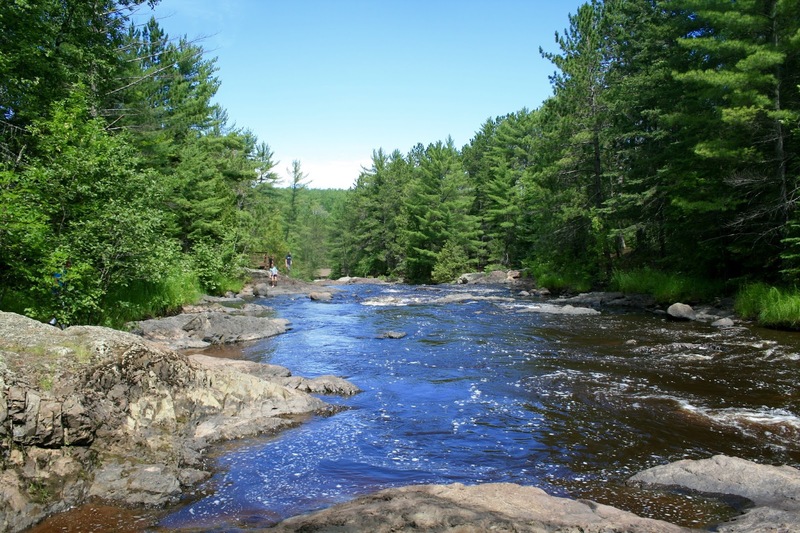 The Ottawa National Forest is a National Forest that covers 993,010 acres in the Upper Peninsula of the U.S. State of Michigan. That's a lot of land, and a whole lot of trees! 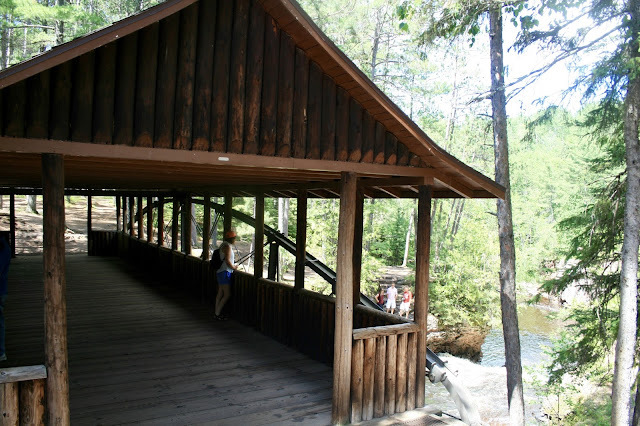 When we first got to the forest and parked our car in the parking lot for the Potawatomi and Gorge Falls we were facing the woods and as I looked at the deep density of the forest I said to my family "That looks like mosquito hell". Everyone laughed, because all week we had been experiencing mosquitos from hell, and now it looked like we were headed right into a thicket filled with them. 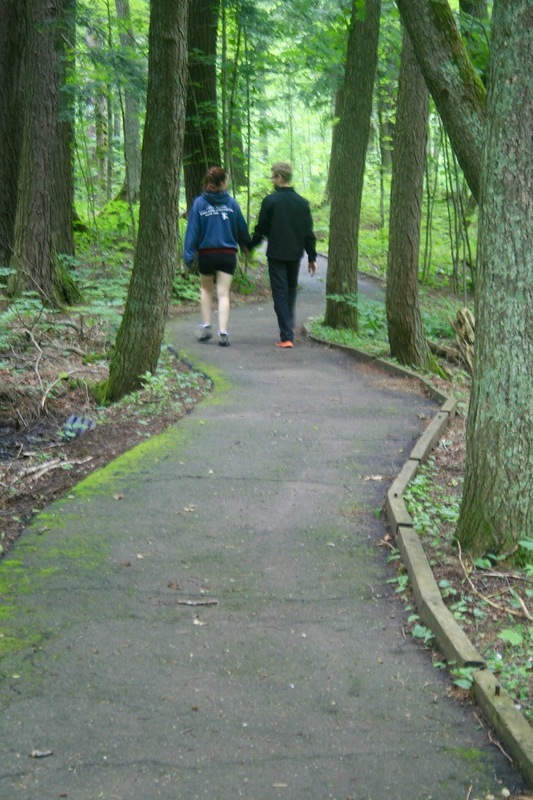 So after lathering and bathing in "Deep Woods Off", we headed onto the trail and hiked deep into the woods. Even though it was the week of the 4th of July, there were hardly any people here. We felt we had all 993,010 acres all to ourselves. Which made me nervous. I feel safer with people around. These woods looked like something out of "Lord of the Rings" movie. They were so filled with....trees! In fact, I saw nothing but trees, everywhere I looked. The thickness of the trees was nothing I had ever experienced before in all my travels. And everything was so lush and green because of the mammoth amount of rainfall we received this year. And yes, the mosquitoes were terrible as expected. Even though they wouldn't land on us because of the "Deep Woods Off", they were still constantly buzzing around our heads and bodies desperately trying to find a place to land. 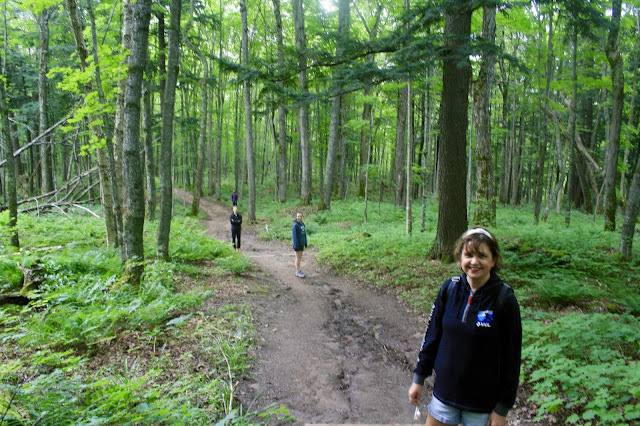 I was so nervous we would encounter a black bear hiking in these deep woods, that I insisted we hike as a group and talk constantly to keep the bears at bay. This irritated my husband to no end, for he really enjoys the peace and solitude of the woods and actually was hoping to see a black bear; so he slowed his pace, and backed off from the rest of the party. And in case your wondering, no, we never saw a black bear or any other animal for that matter, just a lot of mosquitoes. 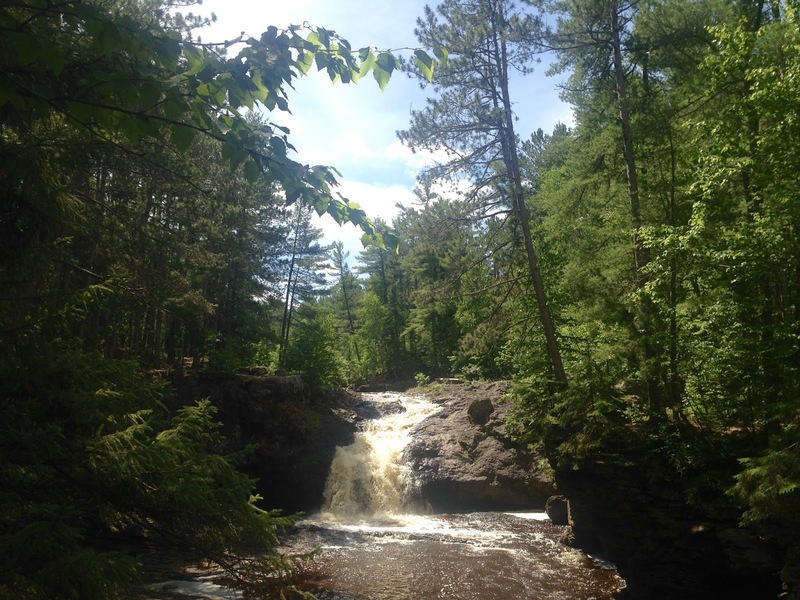 Now after two days of hiking in the woods, my family was getting a little sore from walking, so the real beauty of this day was that just about every water fall was only a short hike from our car. There is basically a road called "Black River Road" (also called The Black River National Scenic Byway) and you drive on this road and pull off and park in designated parking lots of waterfall trails. All the trails are super short and easy (though there are a few with strenuous steps). 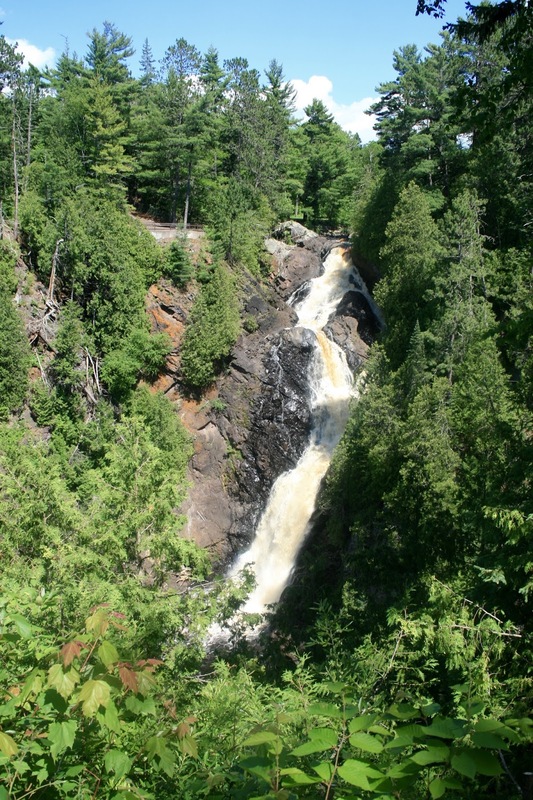 There are five falls to see on this road and you can easily see them all in one day. The road ends at the shores of Lake Superior where you can cross a beautiful suspension bridge and enjoy the beach and have a picnic lunch! 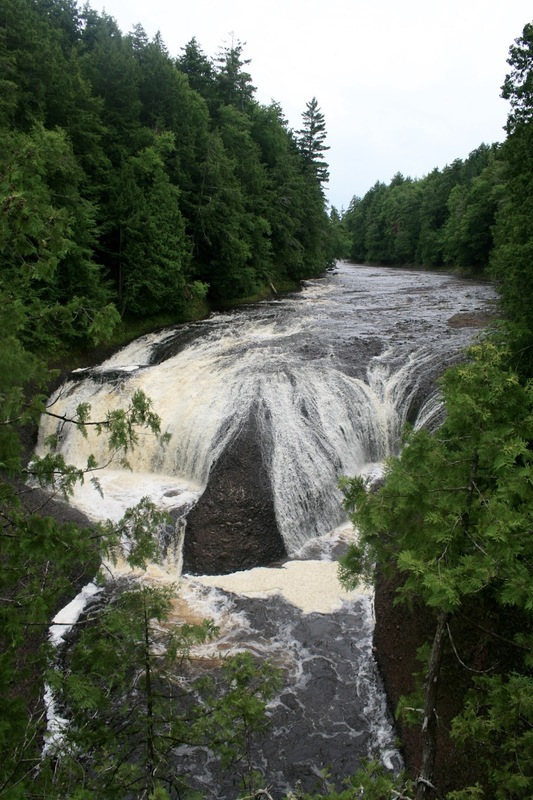 Potawatomi Falls is one of the areas most beautiful waterfalls. It has a twenty foot drop and an eight foot span. It consists of a spit drop over a dome of conglomerate rock that creates two curving waterfalls. 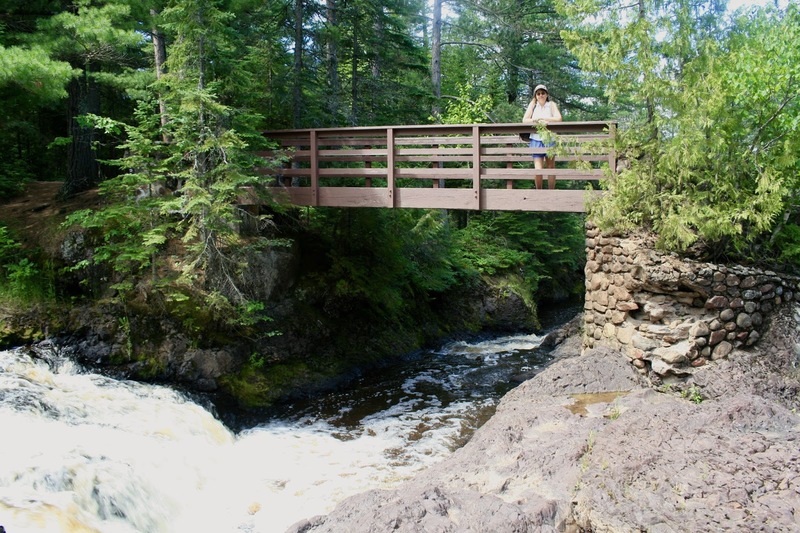 All the trails in this area are extremely well-maintained, easy to follow, and several have nice viewing areas so you can get really close to the falls. 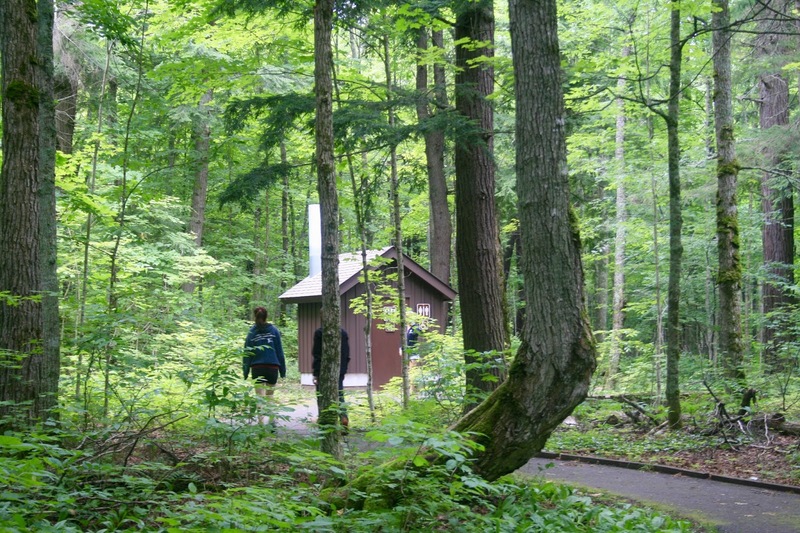 There is even a nice asphalt path that connects Potawatomi Falls to the Gorge Falls, and also on this path is the cutest little restroom I have ever seen! 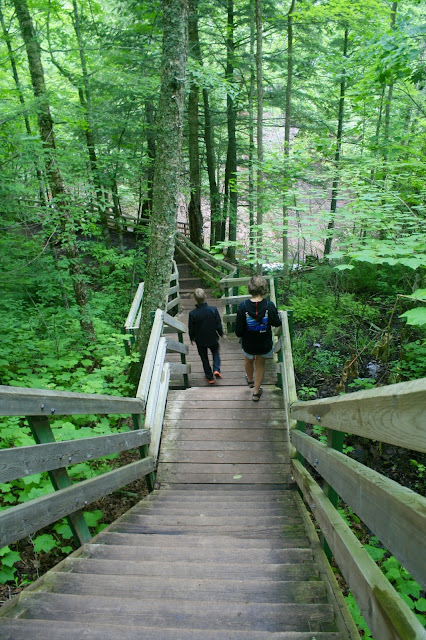 Although Potawatomi Falls and Gorge Falls are only an 1/8 mile apart, the hike down (and back up) can be strenuous for some. 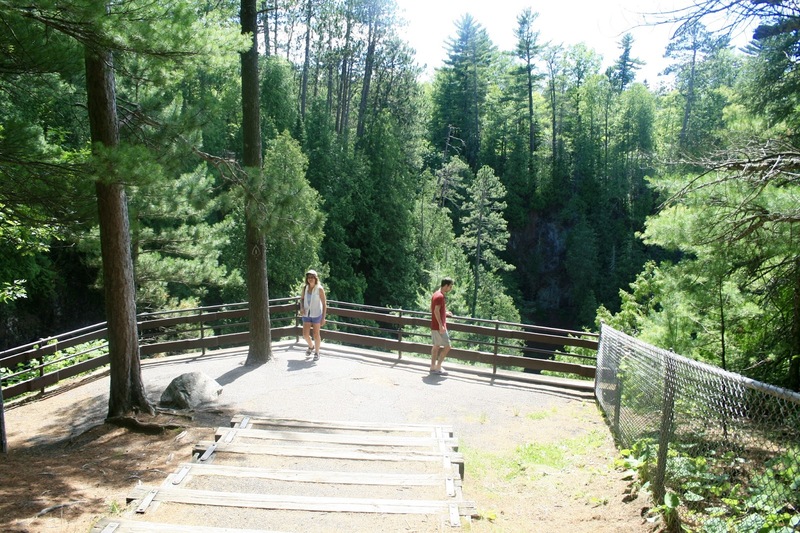 There are very nice stairs with rails to aid you to the viewing deck, plus a few benches to stop and rest along the way. 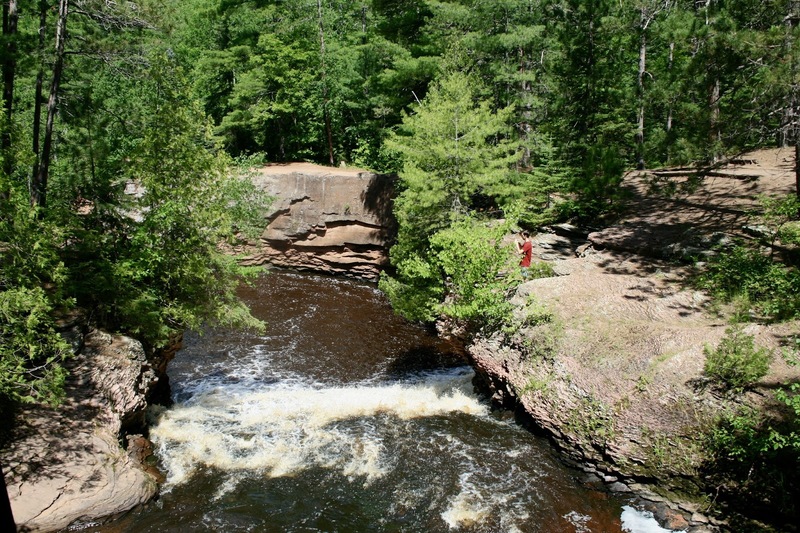 Gorge Falls is named for the deep and narrow gorge above and below the falls. It's height is twenty five feet and it's crest is ten feet. 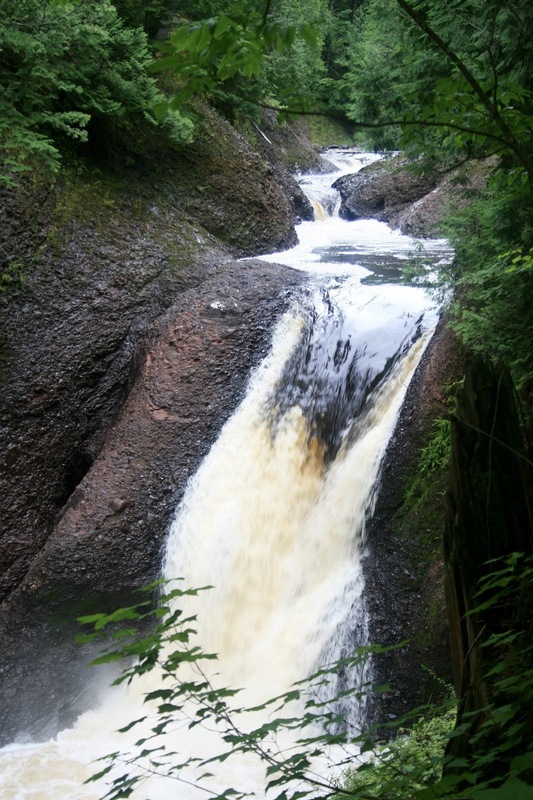 This was one of my favorite falls. 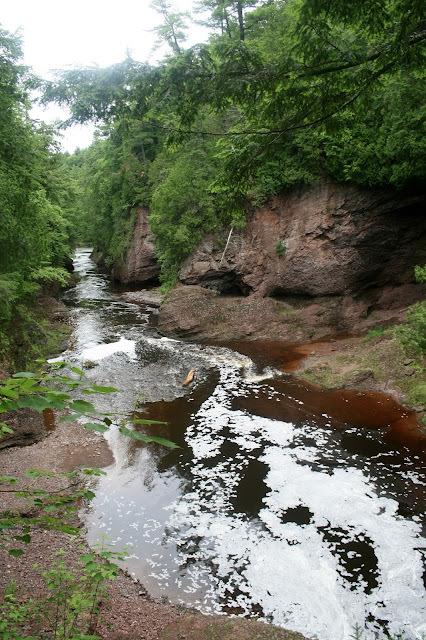 I loved the deep dark color of the rock and seeing all the lush green foliage on the sides of the gorge. 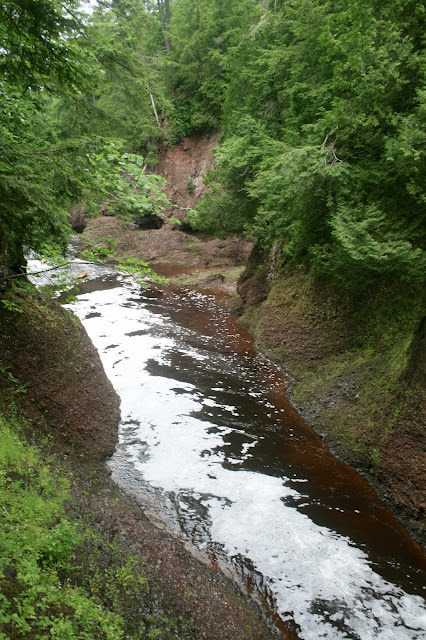 I loved the rich brown color of the water. 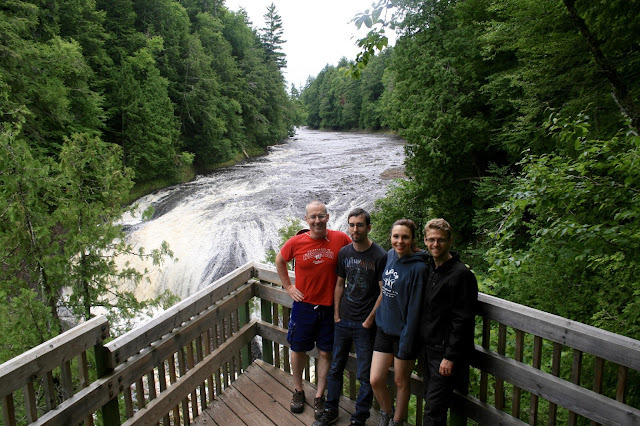 After visiting these two falls, we all agreed we were hungry for lunch before we wanted to start hiking more trails to see the last three falls. 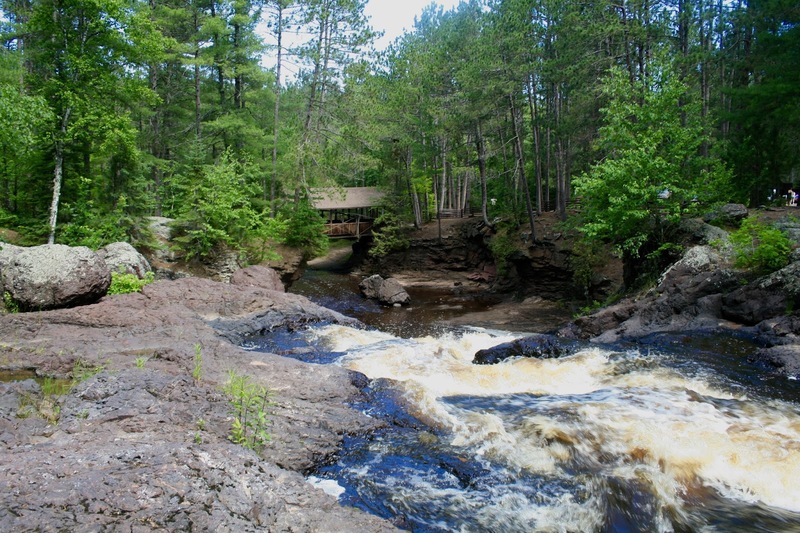 So since Black River Road is actually a dead end road that ends at Lake Superior, we decided to drive there next to have our picnic lunch, see the beach, and then hit the rest of the falls on the way out of the forest. 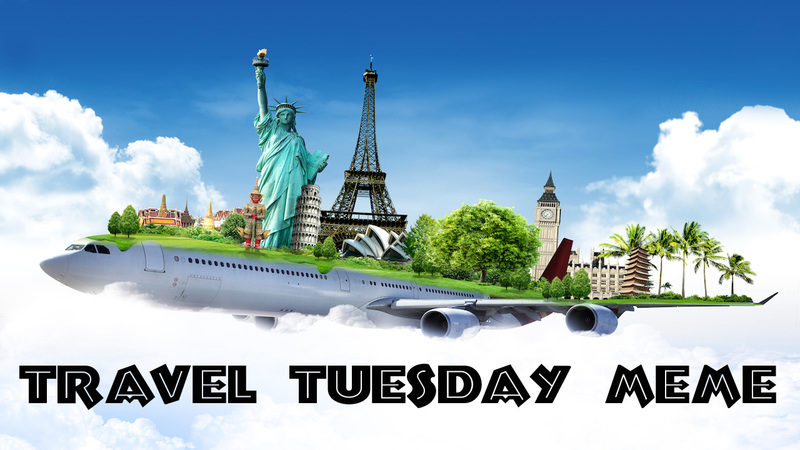 But that is for next week's travel post! See you then! I've been seeing a lot of long sleeveless sweaters on the market and I've been itching to try one out. My first thought was "Whats the point of that? If it's cold enough to wear a sweater, don't you need your arms covered?". However, I've since then changed my mind since finding this olive green beauty from J.C. Penney. The weather in most parts of the country is still quite warm, yet we're all ready to start dressing as if it was not (some were ready way too early...like back in July or August!). Sleeveless sweaters are great transitional pieces because you do not have the covering on your arms, yet the body of the sweater keeps your core warm. I wore this sleeveless sweater when the weather was hovering between the upper sixties and mid seventies. I can honestly say I was not hot all day, but I did get a bit chilled for just a few minutes when I was in an over-air-conditioned grocery store. I wore my sleeveless sweater with slim fitting black ankle length pants (Stitch Fix, old) and camel and black pumps (DSW, old). I accessorized with black and silver jewelry (old) and carried my new burgundy purse (JCP). 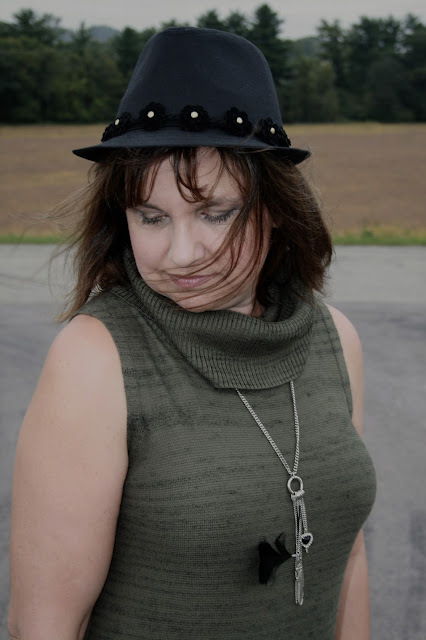 My hair was a mess this day, so I just covered it with a hat that my husband bought for me from Burlington Coat House (old). I'm looking forward to styling this sweater in the colder months. Because there are no bulky sleeves, a blazer, cardigan, or jacket would fit easily over it. You could also wear a long sleeve shirt underneath. Perhaps my favorite feature of this sweater is the length and the slits up on the side. I will definitely be able to wear this top with leggings in the winter and not feel self conscious because my buttocks are completely covered! And the slits are so nice too. Have you ever worn a long sweater before and it just seems to tight at the hips and/or is constantly riding up? I have! It's a pain. The slits make sitting and movement with ease, and there's no riding either. a.n.a. Sleeveless Turtleneck Tunic Vest, JCPenney: HERE, Nicole Miller Kira Satchel, JCPenney: HERE. Whenever I shop for end of season clearance, I'm looking not only for great deals, but also to see if an item could transition well into the next season. When I saw this white gauze sleeveless top at J.C. Penney my first thought was that it would look fabulous under a denim jacket because of the blue braided trim. The sleeveless aspect was a plus for me because I thought it would fit better under a denim jacket too. I don't know about you, but I find denim jackets very uncomfortable to wear. I love the way they look, but I don't like the way they feel. They are so stiff to me. Maybe someday I'll find a more comfortable one, who knows. My jacket is from Express (old) and my jeans are from American Eagle (last season). Here's what the top looks like on it's own. It's a sheer gauze material, so I have a tank underneath. 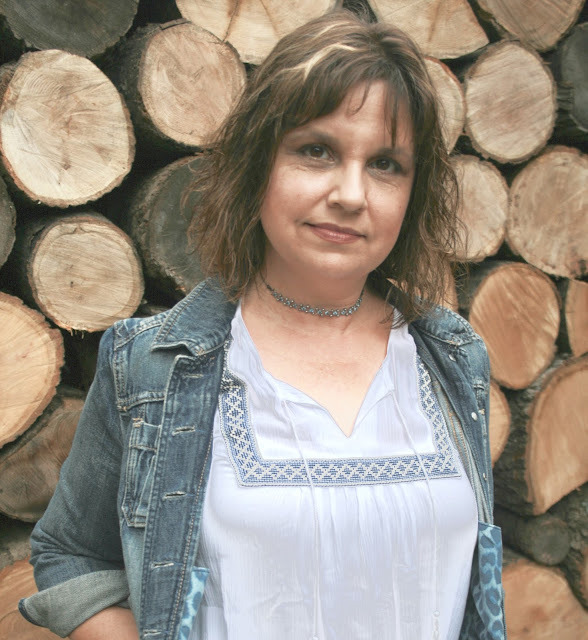 I planned on wearing this outfit to Illinois to see the kids, but it ended up being super hot and humid (90+ degrees) so I ended up wearing the top alone with denim shorts and sandals. I did take my denim jacket with me in case I needed it, but I never used it. It was just that dang hot! The top is very cool and comfy because o the material. It also has an elastic waist, which I love because it helps camouflage my tummy. The only drawback I found was that it wrinkled a bit, which I didn't feel I could fix because if you iron it, you lose the gauzy effect of the material. If this top looks familiar to you it's because I introduced it to you on THIS POST. It has the same braided trim as a dress I also purchased on clearance the same day. I've been wanting to try the choker trend for awhile and I recently discovered I already had one hidden away in my jewelry box. How fun is that? This was the perfect top to wear a choker with because there is already detail in the neckline, so if I added a longer necklace it would only compete with the detail in the top. However, because the choker is so much higher than the detail in the top, it doesn't compete. I do have a new bag to show you!!!!! 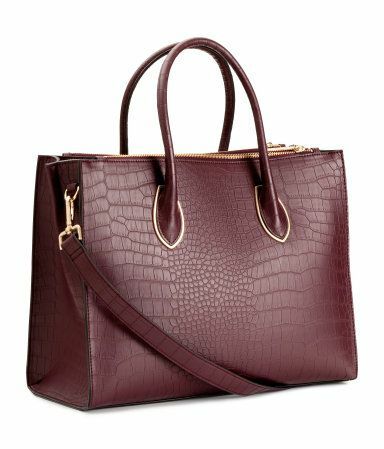 I've wanted a burgundy bag for fall (it's about the only color of bag I did not have in my closet, that and pure red) so when I spotted this cute one I couldn't resist. Of course I bought it at JCP, where else? It's by Nicole, it was originally $75, and was on sale for 40% off. I then used a $10 off coupon so I got it for $35. Believe it or not, that was still more than I wanted to pay because I'm a real cheapskate, but I bought it anyway. My shoes are also from JCP. I bought them last year, but they are still selling them this year. 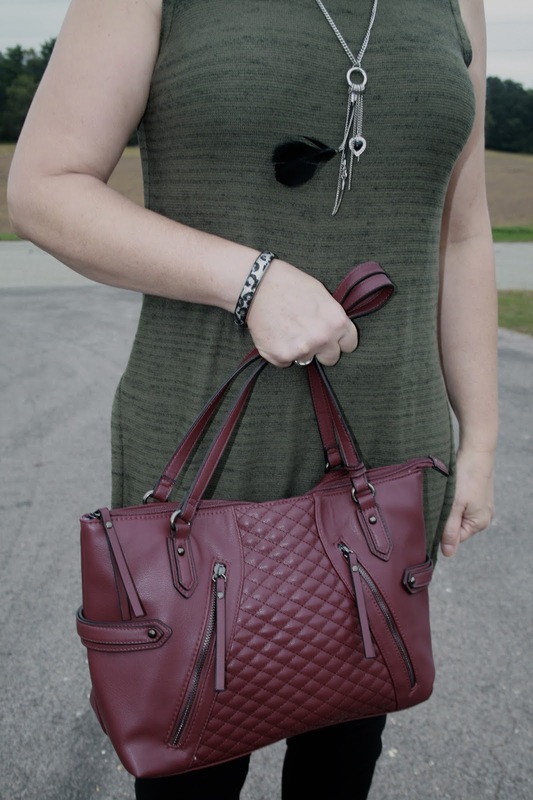 I like how the burgundy bag brings a spot of color into an otherwise neutral outfit. Liz Claiborne Bib Front White Shell Top HERE, Nicole Miller Kira Satchel HERE, Arizona Lacie Wedge Ankle Booties HERE. If your wondering about the wood pile, I just love the interesting back drop it makes, especially with certain outfits like this one. 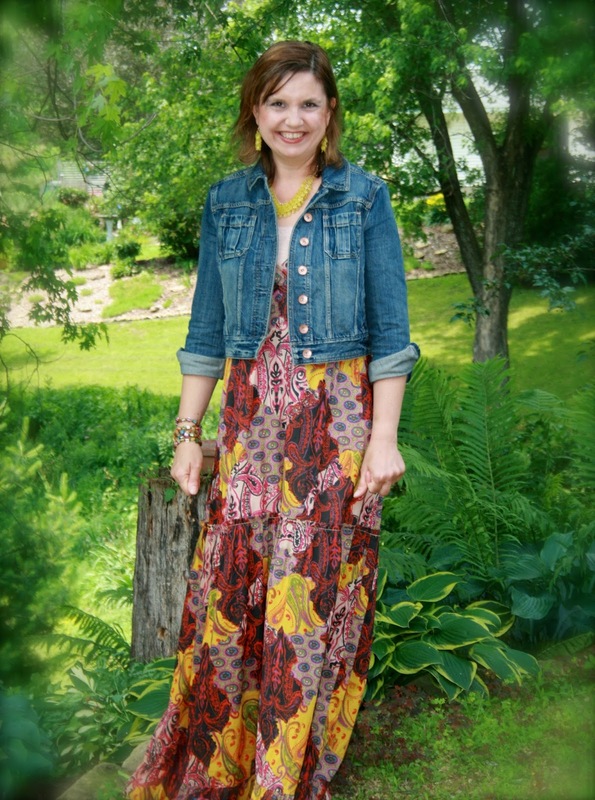 This outfit is 'country style' to me, so what better place to photograph it? That's a lot of wood, eh? And it heats our house for one year. 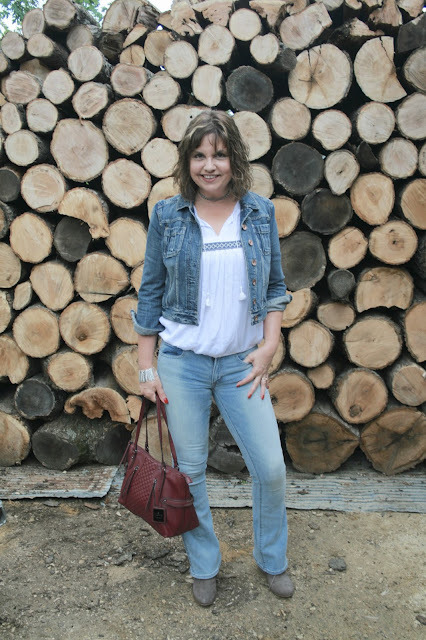 My husband than takes each "tree" and using a chainsaw, cuts it into shorter logs and stacks it up like what you see behind me in the fashion pictures above. Then throughout the winter he splits all those logs into smaller pieces for fires, they then dry outside for about year, then he moves them into our garage for storage and easy access to bring inside our home. The entire process is done by hand. He doesn't own a wood splinter. 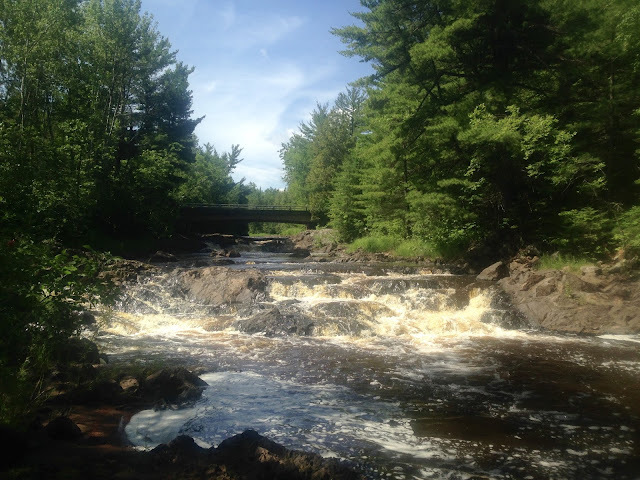 This is a continuation of a travel series about my camping trip with my family in July. To start at the beginning go HERE. 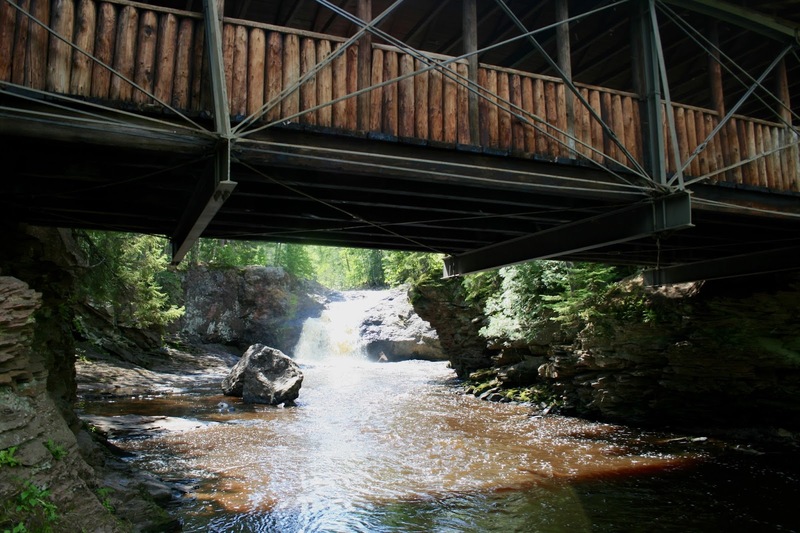 On our second day of our camping trip after a leisurely campfire breakfast of bacon and eggs we hit the road to explore Amnicon Falls State Park and Pattison State Park. 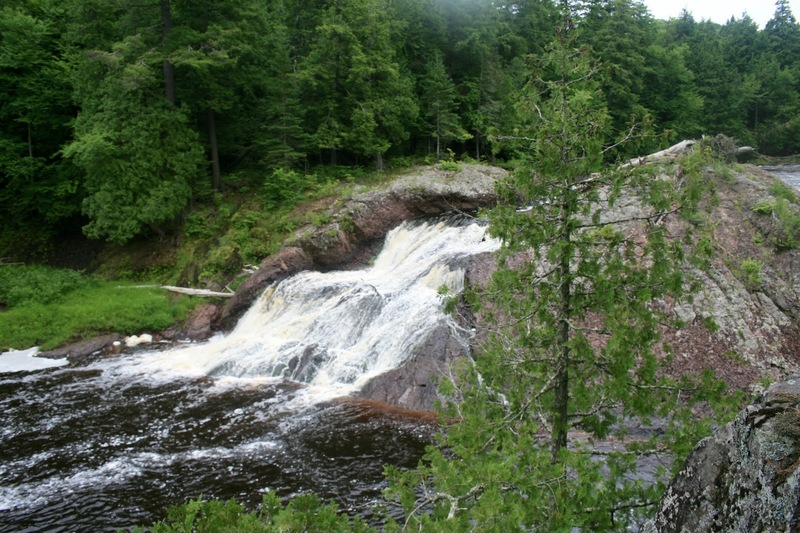 Amnicon Falls is a small state park of only 825 acres that is located southeast of Superior, Wisconsin. 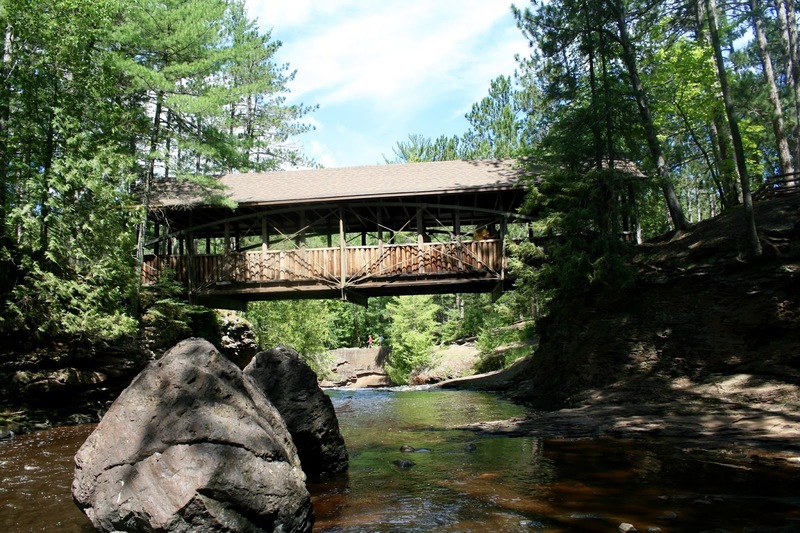 It features a series of waterfalls on the Amnicon River as it flows around a small island and under a historic covered bridge. It was only an hour and twenty minute drive from our campsite. If ever there was a park to take small children to, this is it. The water in most parts is very shallow (not always, so be careful) and the kids can get in and wade and enjoy the falls and swimming holes. 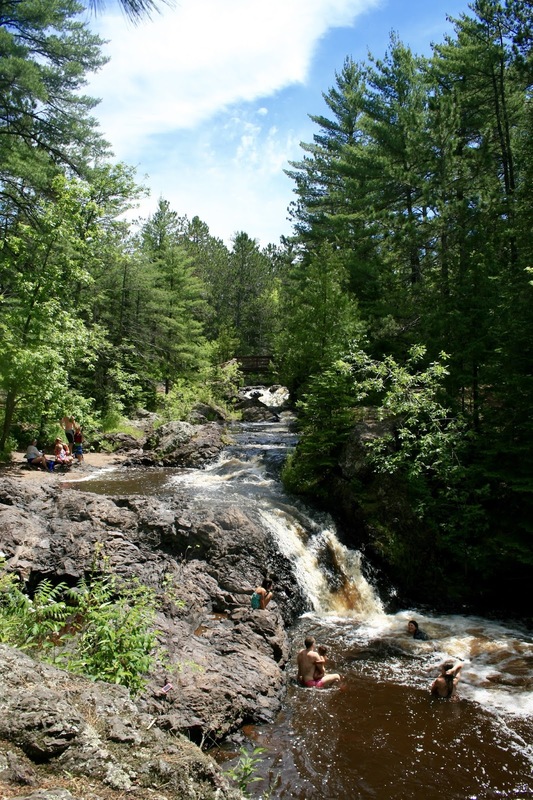 The falls are divided into the Upper and Lower Falls areas and swimming is allowed at both. The trails are beautiful, well-maintained, and super short and easy. It is a very relaxing park. A place to go not for a strenuous hike, but a relaxing stroll through the woods. 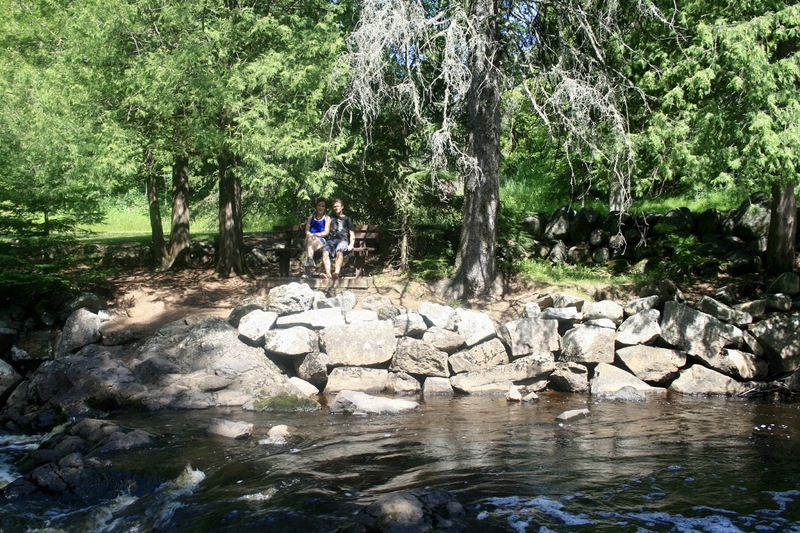 We discovered this old cobble stone bridge on one of our walks. In addition to families, this park is also filled with local teenagers who love to swim here. While my family was perched on this ledge (I'm afraid of heights, so I hung back) they heard a girl screaming for help. She was trapped on a cliff side and couldn't climb down or up. My husband and son asked me to look for a branch or rope to help her, but of course I had none. I called down that maybe I should drive over to the ranger station (cell phones don't work quite well out in the forest) and he said she didn't think she could hold on much longer. So my son climbed over to help her and I got so mad at him. I thought "What could he possibly do? He's just going to get hurt now and all because some dumb teenager did something stupid." I know, I'm so terrible and selfish. I only thought of me and my son at the time. I screamed at Jordan not to help her, but of course he didn't listen to me and then he ended up falling into the water himself. Thank goodness he was alright. He managed to climb back up to her and just stayed underneath her coaxing her how to climb up. Eventually they both made it up. He was so humble and said he really didn't do anything. I was impressed and proud of him (although mad) that he risked his life to help someone else. This is the historic covered bridge. Isn't it pretty? It's like a scene right out of a story book. My son saw these deeper falls and was itching to get wet himself. 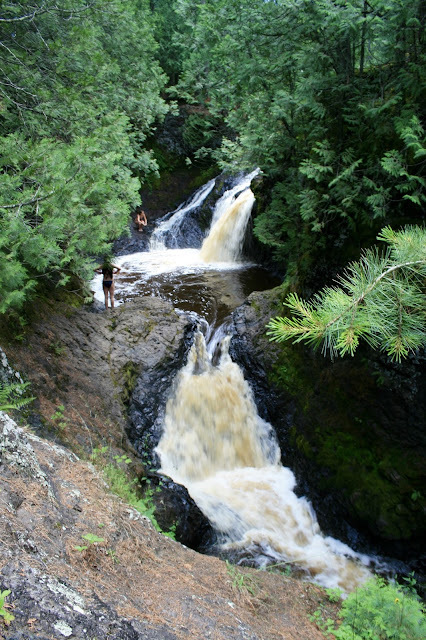 He grew up swimming in waterfalls as there is a waterfall and river right behind our home. We finally relented, although I was nervous. 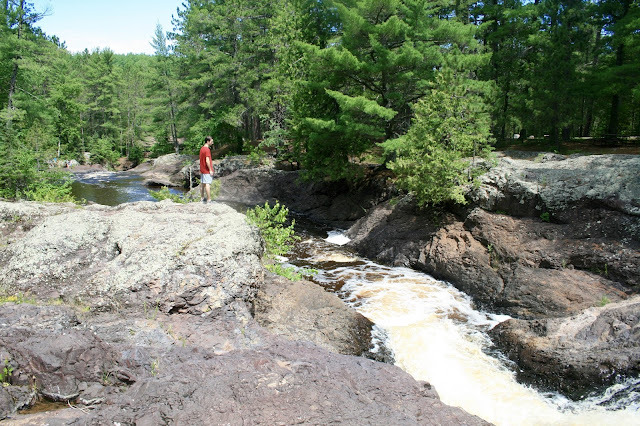 And if you don't want to get totally wet, there's lots of spots to just hop rocks and soak your feet too. This was a shallow pool that families with babies and small children were enjoying. 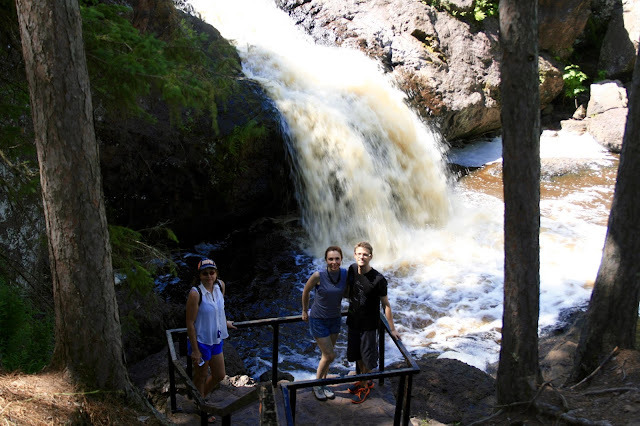 And here are those teenage girls enjoying the more deeper and dangerous falls. And my son finally joined in and went for a dip himself. 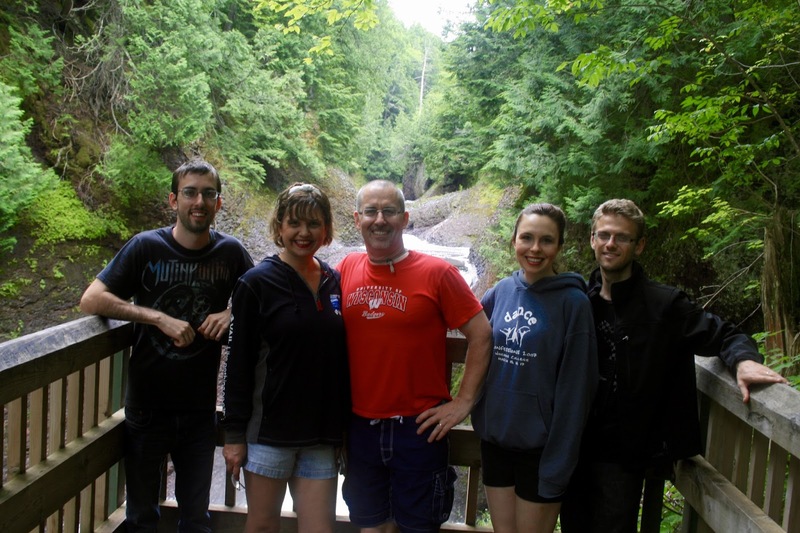 After a picnic lunch, we drove over to Pattison State Park. It was only a 23 minute drive. You may remember this park from these posts HERE and HERE. My husband and I camped in Pattison all by ourselves for three nights and two days. We had so much. 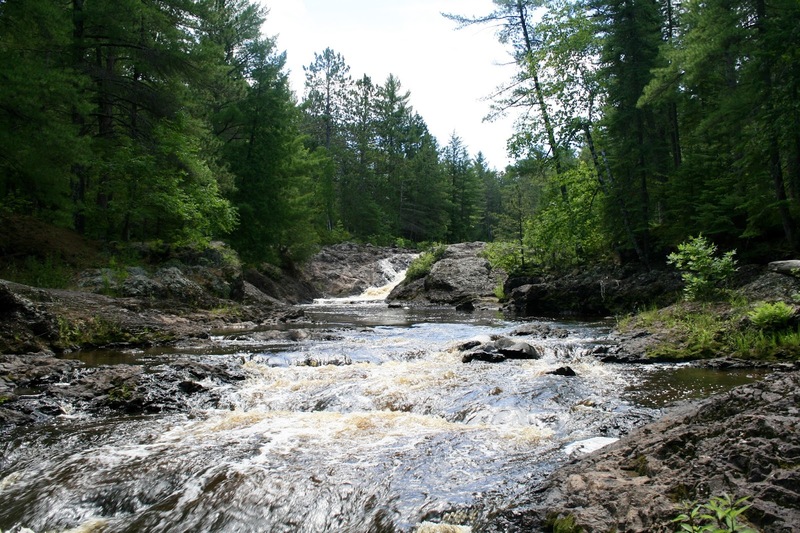 Even though Todd and I had been to Pattison before, we wanted the kids to see it for it has Wisconsin's highest waterfall at 165 feet. 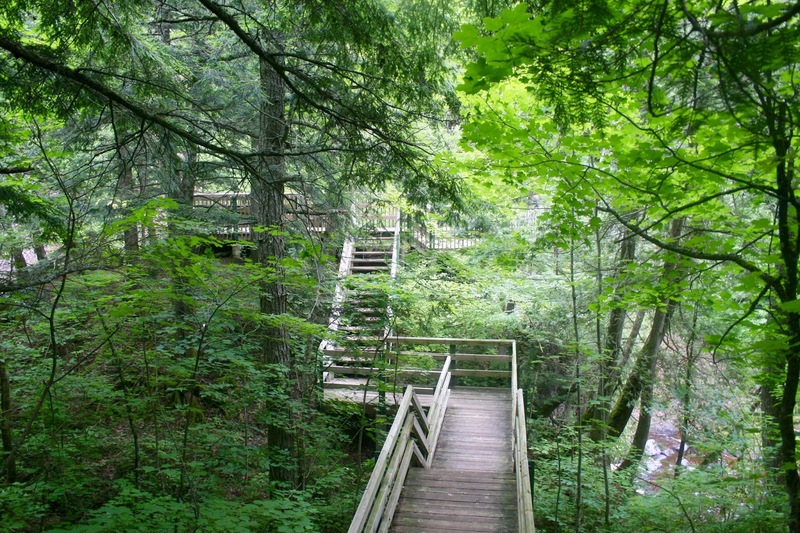 The trail to see the highest waterfall is super short and easy with lots of scenic views and park benches to enjoy along the way. Jordan didn't seem to appreciate the scenic overlooks however. 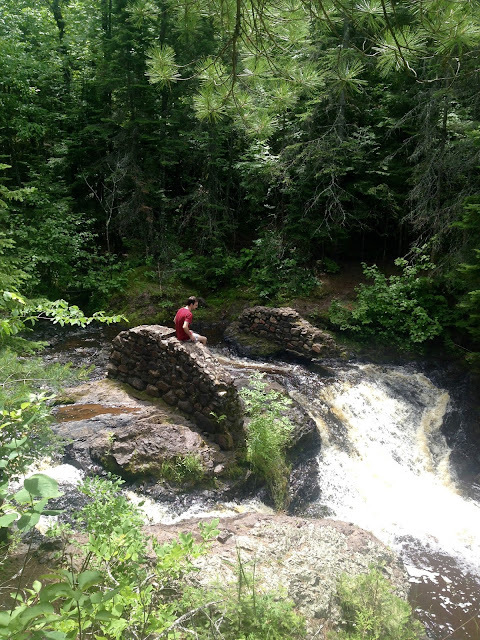 I was surprised to discover he has a slight fear of heights as he spent most of his life jumping off a rock into his own private waterfall. 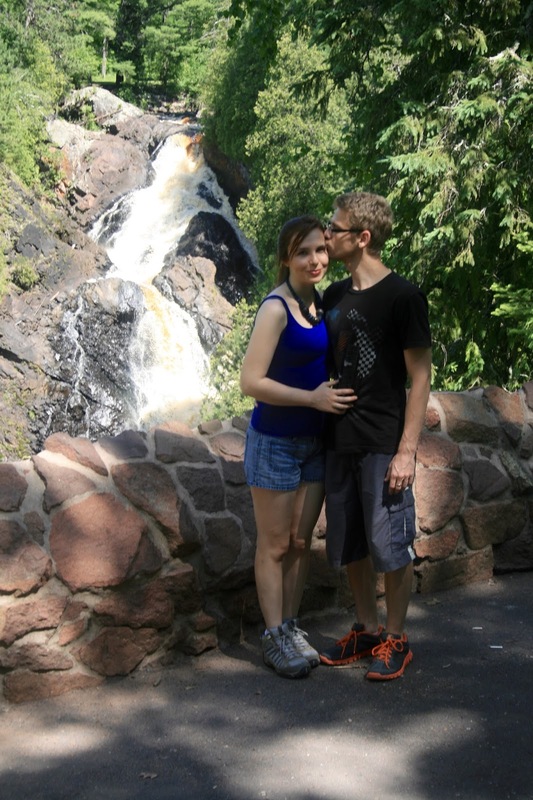 After we saw the tallest falls, Big Manitou Falls, we decided we had done too much car sitting and strolling and needed to get a good hike in, so we took the trail to Little Manitou Falls. This is such a pretty trail. It starts along the back waters of the lake and into the woods. 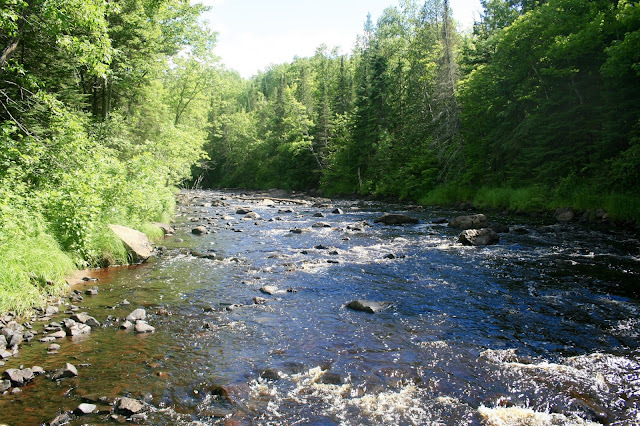 You follow a stream and hear the babbling water for most of the trail. It's a three mile round trip trail. 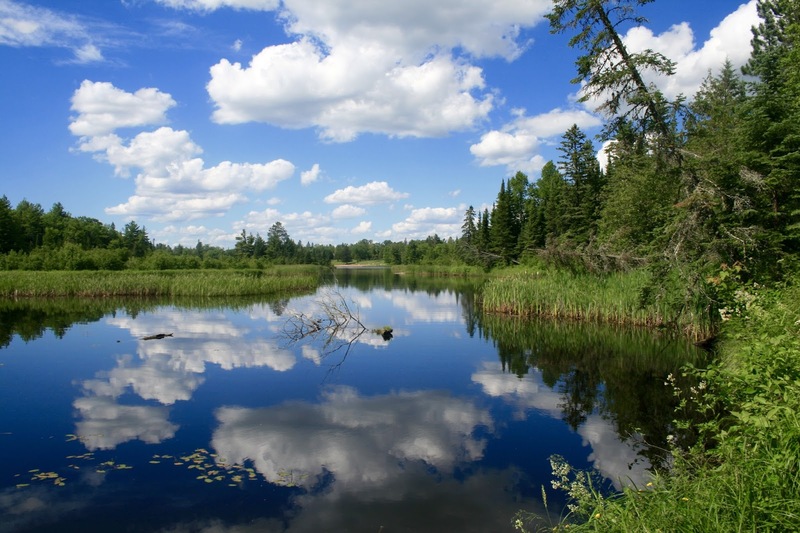 Isn't the mirror image of the sky in this photo just gorgeous? I love this trail because there are certain views like the one below that remind me of the Rocky Mountains. 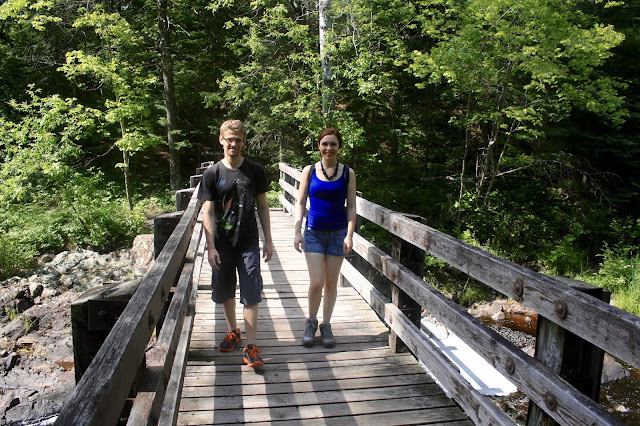 There's also pretty bridges on this trail too! 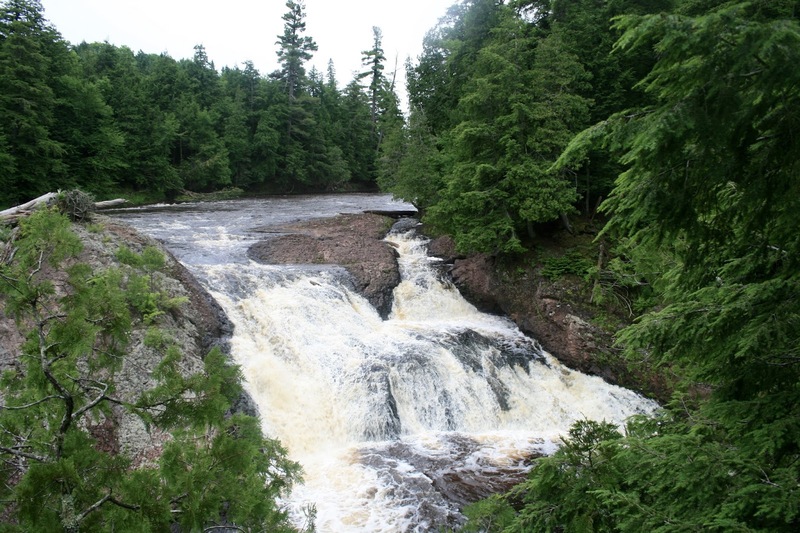 And this is Little Manitou Falls. Which really isn't so little, it's just little in comparison to Big Manitou Falls. It is 35 feet high. I should mention that you do not need to hike three miles to see these pretty falls, There was a parking lot only about .5 miles away. My daughter just about died when she discovered that. She said "You mean we could have just driven here?". LOL! 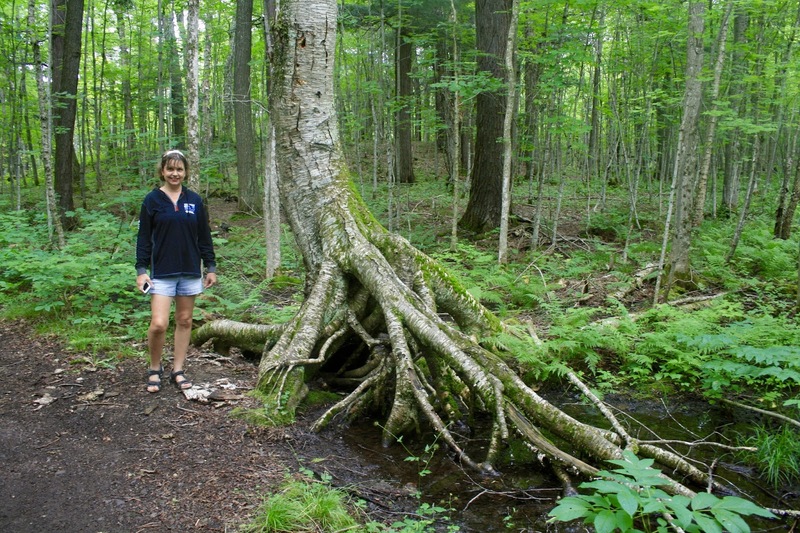 She's not the hiker her parents are!